As always, the high volume of work and planning was well worth the effort. 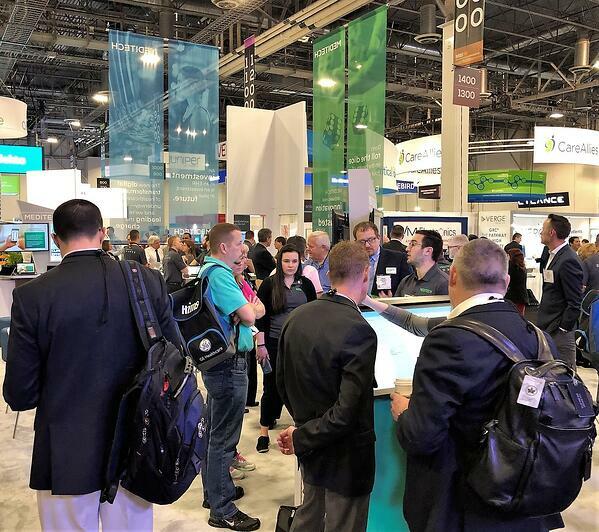 And the three days I spent in Las Vegas attending my first HIMSS Conference presented an opportunity to observe first-hand how our messaging functions in its natural habitat. More importantly, I had a chance to interact with customers and attendees, and get a sense of what they thought of our work. The digital files that our creative team submits are often the last we see of our work until photos come back from HIMSS, so seeing the final renditions of our booth, messaging, and branding materials in person was a valuable experience. What started as JPEG files were now towering cloth banners. The floor plans for the MEDITECH booth had been constructed into a living, breathing workspace. A customer appreciation event at Drai’s nightclub that required nearly a year of planning turned into the best party the Vegas strip saw all week. Usability and physician burnout were major points of focus throughout the conference. People are ready for healthcare to catch up with the convenience and intuitive design of the apps and mobile devices we use every day. I was not surprised that burnout continues to be a hot topic in our industry — in fact, it’s a topic that our blog has mentioned before. Population health accounted for much of the discussion at HIMSS, as we continue to look at how social determinants and preventative measures shape patient care on both the individual and group levels. Patient-generated health data promises to shape patient engagement for future generations, and was tied to some of the more innovative applications showcased at HIMSS. Meanwhile, tantalizing new developments in artificial intelligence had attendees imagining what the medical landscape might look like in 10 years. Healthcare still has a long way to go, but it feels as though we’re rounding a corner. Engaging with MEDITECH’s customer base and discussing our branding proved to be the cherry on top of an inspiring week. MEDITECH proudly introduced Expanse, our latest EHR platform, in the week leading up to HIMSS, and it was wonderful to hear customers respond to the name and messaging with such enthusiasm. It was tremendously validating, and underscored the idea that, even in an industry driven by something as lofty as patient care, the right message can still make a difference. After three days of networking, learning, note-taking, and lots of standing (shout out to Dansko clogs), I left HIMSS18 with a heightened appreciation for the industry we all share. Healthcare might be the most important, rapidly-changing workspace in the world today, and it is flush with brilliant minds who are ready to push care to the next echelon. If I had any doubts about the importance of the work we do is — even in branding — they were long gone by the time I boarded my redeye back to Boston. Seeing it all in person will make anyone a believer. Interested in learning more about Expanse? Click on the link below to watch a video.